CATBALOGAN, Samar – In response to an invitation sent by Dir. Carlos P.Medina of the Ateneo Human Rights Center (AHRC), representatives from multi-sectors coming from Samar gathered at the Flaming Hat Restaurant, Catbalogan last august 27, 2010. A half-day exploratory session with invited stakeholders and Ateneo lawyers, Atty. Khrisna Gomez and Atty. Maria Patricia R. Cervantes, was facilitated by the Social Action Center, Diocese of Calbayog, to discuss the possibility of setting-up of a Multi-Sectoral Quick Reaction Team (MSQRT) in Samar. The MSQRT, an AHRC project assisted by The Asia Foundation, seeks to address the phenomenon of Extra-Legal Killings (ELKs) and Enforced Disappearances (EDs) in selected areas around the country. A series of seminars organized by the Supreme Court of the Philippines and the Philippine Judicial Academy in partnership with other government organizations are initiated to come up with specific recommendations that would address the problem. A concept paper has been distributed to participants during the meeting. 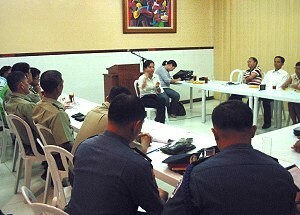 In the said forum, representatives from the Armed Forces of the Philippines, Philippine National Police, Provincial Prosecutor’s Office, Academe, Media, Civil Society Organizations, Church, Commission on Human Rights, Department of social Welfare and Development and the Youth Sector are present. During the exploratory meeting, commitments to support the setting up of an MSQRT in Samar were verbally aired by each member in attendance. Moreover, the body expects to expand the invitation to more interested groups for the Focus Group discussion (FGD) that will meet on September 10, 2010 and discuss details as to the scope, structure and procedure of the proposed MSQRT. Should the Samar MSQRT project be realized, Samarnons will expect for a one-stop-shop of coordinated services that will address the needs of the families of ELK and ED victims. It was stressed, however, that the team will neither focus on criminal justice nor on the creation of a distinct investigative body. It simply intends to build-up the capacity of members to effectively coordinate with stakeholders and effectively reach out to victims. The respective functions of stakeholders will be respected, but a secretariat will be in place to facilitate the services. Lt.Col. Federico Tutaan, G7 of the 8ID, PA welcomed the project saying that it will be a great help in their fight against insurgency. In the same manner, Col. Gardiola of the PNP feels glad that victims of various killings will be given assistance as well as witnesses will be proviced with a sanctuary. Fiscal Aguilar expressed his apprehension regarding the project because of security concerns for advocates. According to him, most human rights advocates are being killed in pursuance of the truth. He was, however, quoted when he said, “It’s good to do something than not to do anything”. On the other hand, the CHR was thankful that their cause in upholding human rights is now a shared responsibility. Fiscal Daiz suggested on the permanency of member representatives for the continuity of deliberations and the involvement of the heads of agencies in terms of commitments. He stressed that with or without the MSQRT, their office continue prosecuting cases as mandated by law. The MSQRT project opens a new hope for Samarnons. ‘Darangpan”, an MSQRT center in Northern Samar is now operational and following up cases in the area. Another MSQRT is being maintained in Leyte. QUEZON CITY – Some one million students enrolled in private high schools nationwide will receive between P5,000 to P10,000 each in tuition aid under the Expanded Government Assistance to Students and Teachers in Private Education (GASTPE) Law, Cebu Rep. Eduardo Gullas, an educator, disclosed Monday. Gullas said total of P5.8 billion in fresh funding has been set aside to subsidize the tuition of private high school students under the GASTPE Law, or Republic Act 8545. Gullas said the amount is contained in the P207.3-billion new budget for the Department of Education (Deped) in the proposed P1.645-trillion General Appropriations Act of 2011. He said the P5.8 billion is 49 percent or P1.9 billion greater than the P3.9 billion earmarked this year for GASTPE. This year's allocation is meant to help some 700,000 students. GASTPE has three components – education service contracting (ESC), the education voucher system (EVS) and the teacher salary subsidy (TSS). In large-scale ESC with private high schools, the Deped agrees to subsidize the tuition of students at a rate of P10,000 each for those in Metro Manila and P5,000 each for those in other parts of the country. In the individual EVS, private high school students who apply for aid would each get a voucher of P5,000 to P10,000, which they can then use to partly pay for their tuition. GASTPE does not have any minimum scholastic or maximum family income requirement, as long as the student stays enrolled, and his or her parents pay for the rest of the tuition. "GASTPE is a four-year funding commitment. A student covered by the assistance stands to receive a total of P20,000 to P40,000 in tuition subsidy throughout his or her four years in a private high school," Gullas pointed out. GASTPE is meant to help decongest and reduce the class size to more manageable levels in public high schools, especially in areas with severe shortages of classrooms and teachers, according to Gullas. He said GASTPE also seeks to ease the growing migration of students to public high schools, mainly due to the soaring cost of tuition and miscellaneous fees in private institutions. In TSS, Gullas said teachers in private high schools who provide instruction to students under the ESC stand to receive salary subsidies ranging from P7,000 to P10,500 per month, depending on their loads. Gullas is author of the 1998 law that established the Adopt-a-School Program, which grants lucrative tax incentives to private entities that aid public schools. Under the program, contributing firms or individuals may deduct from their gross taxable income the amount equal to 150 percent of their assistance. Gullas is also author of a bill seeking to enliven the use of the English language in schools to build up the global competitiveness of the country's future human resources. MAASIN CITY – A mule is an animal used as beast of burden in other countries, having a horse-like appearance but usually smaller than a regular horse. In the illegal drug trade, especially abroad, they also have a language called a “mule,” which means a carrier of a banned substance, like cocaine, among others. But this carrier, who is an unsuspecting person, mostly a Filipino overseas worker who just obliged out of courtesy or social favor, does not know what he or she was carrying about, until an arrest by authorities reveal an inconvenient truth: illegal drugs was in his, her possession. That individual has become a mule for illegal drug syndicates, without him, her knowing it, and we should be wary about this kind of modus operandi, warned Rep. Roger Mercado. During his bi-monthly radio program over DYDM yesterday, Cong. Mercado cautioned his listeners particularly those with relatives or family members working abroad to resist as politely as possible any request to bring a personal, hand-carried item from someone whom they knew, even a friend, how much more a stranger. He said this was the reason many OFWs now founded themselves in jail for a crime which they have been fallen as an unwitting victim. The Southern Leyteño solon made the warning when he was asked for updates on the case of a Maasinhon OWF, his neighbor in Barangay Abgao, by the name of Rudelia Palima, who ended up in a jail in Iran for carrying a banned substance the “padala” way, or the mule way early this year. Palima’s case was already refered to Department of Foreign Affairs (DFA) Undersecretar Conejos, the one in-charge in handling such kind of concerns, Mercado said, adding that a fund was already set to reach the prison in Iran. He said he immediately saw in person DFA Secretary Alberto Romulo after learning about Rudelia’s plight. Rudelia’s father, who was listening since the start of the radio program, called in to say on-air his gratitude for the efforts made by the solon to free her daughter. CATBALOGAN CITY – The Calbayog Philippine National police (PNP) led by Calbayog Chief of Police nabbed one Renato Manota y Torculas, 60 years old of Purok 1, Barangay Trinidad, Calbayog City. He was suspected to have planted marijuana in his residence. He was the subject of Oplan Sangbanat which PNP Calbayog conducted on July 29, 2010. According to the police report, on July 29, 2010, a PNP Team of Calbayog City Station led by PSupt Nestor Valenzuela together with PS1 Delfin Jaropojop, Jr., PS1 Antonio Cruda, SPO3 Genaro Nabual, SPO3 Gershon MOngas, SPO1 Inocentes Laure, SPO1 Crispin Singzon, PO3 Victor Dangco, Jr., PO2 Gerry Liray and PO1 Diomedes Aquiliño in coordination with PDEA-8 conducted a search in the premises of he residence of Renato Manota, Sr. situated at Old National Road, Purok 1, Barangay Trinidad, Calbayog City. The search was conducted by virtue of search warrant number 01-10 dated July 29, 2010 issued by Executive Judge Reynaldo Clemens of RTC Branch 31. The search resulted in the confiscation of three (3) pieces of suspected marijuana plants each measuring more or less fifteen (15) feet, twelve (12) feet and five (5) feet. Also found was one (1) plastic pouch containing dried suspected marijuana leaves and two (2) pieces seed boxes with suspected marijuana seedlings. The police also arrested one Renato Manota, Sr., alias Rene, 60 years old, married, retired ATO personnel and a resident of Old National Road, Purok 1, Barangay Trinidad. CATBALOGAN, Samar – Mayor Renato Latorre got elected unopposed by his co-mayors as the new president of the League of Municipalities of the Philippines - Samar Chapter held last August 23, 2010 at the DILG Provincial Office in Catbalogan, Samar. Mayor Serrano’s nomination for the chapter presidency of the Villareal Mayor was immediately closed and unanimously seconded. It has left other would be contenders, no chance to get nominated. Moreover, the eighteen (18) mayors present, representing a quorum, opted to refrain from the usual confirmation of votes either by secret balloting or by raising their hands. Instead, Latorre was given the full discretion to choose the other mayors who will complete the new set of officers for the league. A meeting held at Fortune Hotel in the afternoon before the election which was attended by the Samar mayors has confirmed the suspicion of spectators that the election was pre-arranged. In attendance during the said meeting were eighteen (18) mayors. At least six (6) mayors coming from the Municipalities of Tagapul-an, San Sebastian, Motiong, Pinabacdao, Zumarraga and Talalora were recorded to be absent. Leyte Board Member, Roque A. Tiu represented the League of Municipalities of the Philippines National Board in the election. Likewise, the DILG Provincial Diretor, Mr. Artemio Caneja was present to oversee the procedures. It was presided by outgoing LMP Samar President, Mayor Melchor Nacario of Calbiga, Samar. 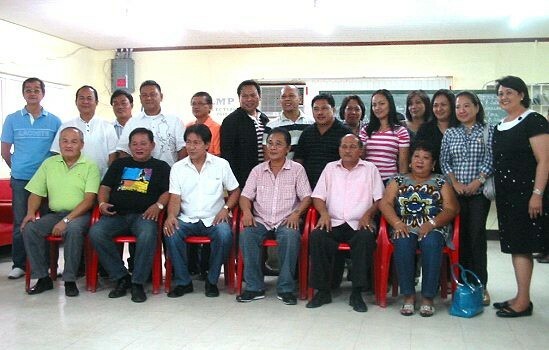 Together with Mayor Latorre, other elected officers of the LMP Samar Chapter included Sta. Margarita Mayor Alfredo Serrano as Executive VP, Sta. Rita Mayor Lisandro Kim Adolfo and Pagsanghan Mayor Ruben Palma as VPs for 2nd and 1st District, respectively. Elected as Secretary was Marabut Mayor Percival Ortillo, Jr., while Tarangnan Mayor Emmely D. Olaje was appointed Treasurer. Almagro Mayor Kathleen S. Prudenciano was chosen as the External Auditor while Daram Mayor Lucia Astorga was the Internal Auditor. Paranas Mayor Boy Babalcon was appointed as Public Relations Officer and Mayor Alejandro Abaratigue of Hinbangan got the position as Business Manager. Chosen as members of the Board were Gandara Mayor Antonieto T. Cabuenos, Sto. Niño Mayor Lilia Coñejos, Jiabong Mayor Jocelyn de Jesus, Matuguinao Mayor Melissa dela Cruz, San Jorge Mayor Nancy Grey, Basey Mayor Igmedio Junjie Ponferrada, and San Jose de Buan Mayor Ananias Rebato. The new set of LMP Samar chapter members is composed of seven (7) lady mayors. Out of the twenty four (24) Municipal Mayors, eight (8) are newly elected while the rest are incumbent mayors of their respective municipalities. Immediately after the confirmation of the new set of Officers, Mayor Latorre thanked the group for entrusting to him the LMP leadership. He encouraged the mayors to lobby for the inclusion of their programs/projects in the Provincial Investment Plan. He expressed his desire to strengthen unity and cooperation among members. “Kinahanglan gud nga magkaburubligay kay danay ginpapapirma la kita ngan deri kita gin papabasa. Let’s work towards the development of our respective municipalities”, were Latorre’s final statements. It was understood that he was referring to the preparation of the Annual Investment Plan of the province where mayors are allegedly just made to sign even if the items included were not submitted as priority projects that mayors would like to implement. Mayor Latorre and party proceeded to Tony’s Kitchen where lunch was served and the first meeting of the officers was held. The Samar mayors with Leyte BM Roque Tiu (seated far left) and DILG Samar director Artemio Caneja (seated 2nd from right) in a picture-picture after the election of the new set of officers for LMP-Samar. CALBAYOG CITY – If it’s a political intervention, it should be a political solution. Since I am not a politician, I will not be dealing with any political matter, said newly-installed 8th ID Commander MGen. 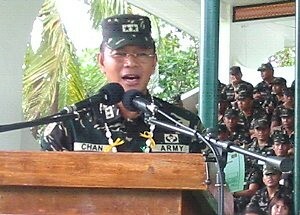 Mario F. Chan in an ambush interview of SN.com after the Change of Command Ceremony held recently at Camp Lukban, Catbalogan, Samar. The issue came out in the midst of political bickering in the area where leaders had exercised their power and influence over the “apolitically cloistered organization” in the previous May 2010 elections through an alleged payoff or favors sought by either of the party. Anyhow, the negative notion and impression did not affect the continued implementation of the 8th ID’s anti-insurgency programs by strengthening its civil-military and internal security operations as well as inculcating with greater measure of conviction among the personnel their duty towards the attainment of peace and development in their respective area of responsibility. Chan also admitted that insurgency problems could not be solved solely by the military but with the strong support of all the stakeholders like the local government units and other concerned agencies as well as the Eastern Visayas’ Regional Peace and Order Council (RPOC) and the Regional Development Council (RDC). LTC Federico Tutaan added that the G-Staff will brief the new commander on the current situation in the area to be used as his benchmark in making assessments in conceptualizing and effecting future policies. On the other hand, aware of August 21 PNP Catarman ambush, PA’s Commanding General Arturo Ortiz said that the offensive attack brought about by the CPP-NPA was a violation of the Geneva Convention. The element of deception was committed in the murder of a retired military; and the reaction of the PNP was long anticipated which yielded to their death (sudden attack and landmine use) when they proceeded to the area. MGen. Ortiz added that the Philippine Army will intensify its inter-agency coordination/cooperation especially with the PNP and the latest ambush in Northern Samar will be their basis in studying the strength of CPP-NPA in the area. Taking cognizance of MGen. Arthur Tabaquero’s success during his incumbency, Ortiz is assured of Chan’s competence, who vowed to combat insurgency problem in his AOR by less than two years. TACLOBAN CITY – After much talk about being postponed, the barangay and Sangguniang Kabataan elections will be held on October 25, 2010 as scheduled, the Commission on Elections informed. The Commission on Elections said that the lawmakers agreed during a meeting on April 24 in Malacañang to go on with the elections. There were proposals to shelve but these were not acted upon so the elections will push through as scheduled, Comelec Chairman Jose Melo said. Although there were proposals regarding the elections, the preparations were not shelved despite proposals to postpone the elections, and so the Comelec is ready. The Comelec said it is also preparing for the holding of Electoral Registration Board (ERB) hearings on the list of voters. The ERB will look into oppositions filed against the applications for registration of certain voters. Through the procedure, the Comelec will be able to weed out voters with double or multiple registrations. Earlier, the Commission on Elections passed Resolution No. 9002 promulgating the guidelines in the clustering or grouping of precincts for purposes of the October 25, 2010 Barangay and Sangguniang Kabataan Elections. The Comelec foresees the insufficiency of teachers who will serve as member of the Board of Election tellers and the shortage of school buildings as polling centers for the October 25 barangay and SK elections. Among the guidelines provided for by the said resolution is that only precincts within the same barangay and the same voting center shall be clustered/grouped; daughter precincts shall, as far as practicable, be clustered or grouped with its mother precincts. For Barangay Elections, the aggregate number of registered voters in the clustered/grouped precincts shall not exceed four hundred (400) while the Barangay clustered/grouped precincts shall not exceed three (3). CATBALOGAN CITY – The newly installed Commanding General of the Storm Troopers Division will do a lot of proving to the Samarnons by concretizing into actions his management policies and strategies in crippling the insurgents' activities in the area. This was after his remarkable assumption speech was delivered on the occasion of the Change of Command Ceremony of the 8th Infantry Division held last August 25, this year at the 8ID grandstand. MGen. Mario Fontanella Chan, has assumed his post as the16th Commander of the 8th Infantry Division (Storm Troopers) Philippine Army based in Camp Lukban, Catbalogan, Samar. Chan's replacement of MGen Arthur I. Tabaquero, who was re-assigned to the NCR Command, was by virtue of General Orders 571 dated August 17, 2010. In a very well delivered assumption speech that has received a remarkable impact to the audience for its sincerity and simplicity, MGen. Chan narrated his outstanding accomplishments in the 4th ID, his previous assignment as Commanding General. He expressed his confidence that his assignment to his new post is in recognition of his ability to command. He mentioned without bragging the fact that under his leadership, the 4th ID was awarded twice as the "Best Division" by two Commanding Generals of the Philippine Army. Chan considers teamwork and human development investment as major factors in achieving organizational goals. He recognizes the importance of capacitating people as the greatest asset in any successful institution. Thus, he ordered the pursuance of their mission to stop insurgency, but not leaving behind his men's well being and welfare as a priority. "Samar is definitely a new and welcome challenge to me. It is said to be where the first battalion formation of the New People's Army was organized," says Chan. However, he expressed his readiness to address the challenges, further stating that he will not fail the Armed Forces and the Filipino people. Furthermore, he promised to fully empower his troops. "I will work with you, struggle with you and fight for you. Beginning today, I will make sure that not one of you will be left unattended," was his assurance. Chan clearly made his advocacies in promoting a participatory leadership, instilling discipline and the protection and promotion of human rights as guiding principles. He stressed that the will to fight and the capacity to fight should always go hand in hand. Investing on human development and enhancing the morale of team members will lead to victories. He motivated his men to strengthen unity and solidarity as foundations of teambuilding. As part of the commander’s strategies, he will continue forging alliances with all stakeholders. "We need civil society's support. After all, insurgency is a social menace", he adds. It is also his belief that insurgency is an economic and political problem that needs empowered local government units that will provide those solutions. Likewise, he will continue soliciting media’s support after fully recognizing its indispensable role in giving the right information at the right time. His speech got the media’s interest when he assured the Samarnons to complete his mission in neutralizing the armed movement in a shorter period time. Chan didn't fail to express his gratitude to everyone who became part of his accomplishments. He ordered his men to buckle up and his final challenge was simplified with this statement, "From this moment and until I relinquish my post as your Division Commander, WALA NG ATRASAN ITO. The only way to go is forward." The National Democratic Front-Eastern Visayas today said it is one with the Catholic Church in fighting large-scale foreign mining in Region 8. "We agree with the stand of the Palo Archdiocese that large-scale mining today will not benefit the people but only foreign capitalists, as well as seriously damage the environment," said Fr. Santiago Salas, NDF-EV spokesperson. "Indeed, foreign mining seeks the quickest way to make profits from simple raw materials extraction and export, without contributing to our industrial development and without regard for safeguarding the environment. Thus, the Aquino government's fast-tracking of foreign mining projects in Samar and Leyte is immoral and unjust for betraying the people and the national patrimony, as well as being anti-development and anti-environment." Fr. Salas added that the foreign mining issue also opens up other related issues of the people regarding genuine economic development. "An economic issue like foreign mining brings up the dire socio-economic conditions of the masses of the people who suffer from landlessness and joblessness. Meanwhile, the minority made up of the landlords, big business and big bureaucrats control and plunder the economy together with foreign monopoly capital. The Aquino government's push for large-scale foreign mining is therefore plain highway robbery in the interests of the few. On the other hand, any plan for national development should have agrarian reform and national industrialization to benefit the majority who are the peasants and workers. Genuine land reform will liberate the peasantry from poverty and contribute to the production of raw materials for industrial production. National industrialization will create jobs and manufacture the country's needs." The NDF-EV spokesperson called for broad unity against large-scale foreign mining in the region. "The various sectors can unite and carry out mass actions and other activities in demanding a stop to foreign mining in the region and for the scrapping of the Mining Act which makes it possible. They must furthermore continue the struggle against the the Aquino regime's economic policies that are anti-people, anti-national and subordinate to imperialist globalization. They must assert genuine agrarian reform and national industrialization as essential for economic development. In the future, the struggle for economic emancipation and sovereignty will find fruition when the people's democratic government has been built to serve the interests of the majority." CATARMAN, Northern Samar – A certain Mr. Rolando de Guia, an innocent barangay councilman in Brgy Imelda, Catarman this province was shot to death by the New People’s Army at around 5:30 in the morning, August 21, 2010. The fully armed local terrorist numbering ten forcibly entered the latter’s house when he was executed. The victim suffered a fatal wounds in his head, chest and legs that caused his instantaneous death. Philippine National Police Officers on board a police mobile car at around 7:45 led by Police Senior Inspector Necasio San Antonio, the Deputy Chief of Police of Catarman PNP Station proceeded to investigate the killing and to recover the dead body of de Guia when a landmine exploded and followed by a burst of fire from the New People’s Army. Though already dead, they were finished off individually by shooting their heads to ensure their death, and torched the vehicle where San Antonio and the driver were still inside. These eight officers were brutally killed. The New People’s Army thereafter fled carting away the firearms of the police officers and stealing their personal belongings. The ambush was about four hundred meters away from Barangay Imelda. The PNP Officers were just performing police duties to investigate the killing, they are not performing combat operations when they were waylaid by these terrorists. They were non-combatants. Colonel Oscar P. Lopez, 803rd Brigade Commander strongly condemned the atrocity by the New People’s Army, expresses his condolences and sympathy to the families of the police comrades. Colonel Lopez urged the civil society and human rights advocate in condemning the inhumane killings perpetrated by the NPA on these peacekeeping officers and barangay councilman. This violent incident is considered as a barbaric act and against human rights. The use of landmines is prohibited under international rules of war. In spite of the peace initiatives by the government, the local terrorists have continuously refused to give peace a chance and resort to violence to sow panic and fear among the populace. He urged every citizen to be vigilant and not to be cowed by fear by these local terrorists. The Philippine Army in Northern Samar will take concrete measures and will exert effort to ensure the safety and security of the Nortehanons; he concluded. TACLOBAN CITY – Hospitals run by the provincial government of Leyte posted a collective income of more than P36 million during the first and second quarters of 2010 which is P8.4 million higher from the income earned by the hospitals under the same period in 2009. Topping the earning bracket are the Ormoc District Hospital with P8 million, Leyte Provincial Hospital with P7.7 million and Western Leyte District Hospital with P5.6 million. The rest of the province hospitals that also went up to the million mark in income were Abuyog District Hospital, Hilongos District Hospital, Burauen District Hospital, Manuel B. Veloso Memorial Hospital and Carigara District Hospital. Already halfway into the calendar year 2010, the income posted for the first two quarters is seen to boost the hospitals’ income benchmark and help surpass its P60 million income posted in 2009. Governor Petilla, in his recent visit to the Leyte Provincial Hospital said that this increase income should inspire the doctors, hospital staff, personnel and management to provide better and efficient service. The net income being earned respectively by the hospitals are divided into the province’s share and hospital share. The hospital’s share are then divided into 30% MOOE, 30% capital outlay and 40% employees share. “We are steadily going working towards that objective. Hopefully, we would realize it soon,” Gov. Petilla added.